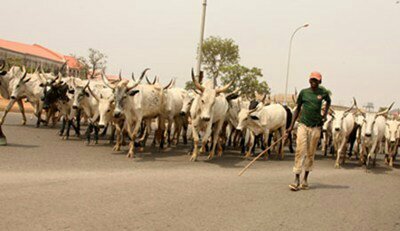 The Lagos State Government has said that a number of no countries, that share border with the northern states, are importing all manner of disease-infected cattle into Lagos due to porous border. The state government also warned that all its residents should desist from patronising any unauthorised slaughter slabs, noting that most of the disease-infected cattle end in such illegal slabs. The Senior Special Assistant to the Lagos State governor on Agriculture, Dr. Funsho Nuraini disclosed the information at a news conference he addressed along with Chairman of the Lagos State Environmental and Special Offences Enforcement Unit, Mr. Bayonle Suleiman following the arrest of three operators of illegal slaughter slabs.According to him, the carcass on the ground had confirmatory evidence that the particular animal had tuberculosis. “Once you kill an animal, you will see if it is not normal. If it is normal animal, it will not be coloured like this. This is a typical tuberculosis-infected animal and it is not good for public consumption,” he said.Nuraini lamented that the head of one of the cows butchered was infected with tuberculosis, noting that such meat could be very contagious, deadly and dangerous to the public health in the state. He explained further, that “Some of these butchers even know the animals are bad. Yet they still slaughter them for sale. They smuggled in unhealthy animals through our porous borders.Whe you go to the animal market at Agege, you will see that animals are being supplied from over 17 countries. “Most of the landlocked countries across our northern borders supply Nigeria with animals and where is the first port of call, Lagos. Lagos has the largest market in the whole of West Africa. We have no fewer than 20 approved abattoirs in the state. It is just that these people are not honest people. “We tracked down three illegal slabs at Ajegunle, Alapere and Ajelogo. We are doing our best to track down the others .We know it is not easy. The markets keep evolving daily. Over 3000 animals are slaughtered daily, so we have to go after them right, left and centre.”Also speaking at the conference, Sulaiman, a Chief Superintendent of Police (CSP) said the state government had been meeting with the market unions where these illegal slaughter slabs operate “to warn them not to allow such things in their markets.”He vowed to clamp down on illegal slaughter slabs throughout the state, noting that it “is time for enforcement. You can see infected meat on the ground. God knows how many families who will have bought it if not intercepted.“If 50 families buy from this meat, they will all have tuberculosis.